Mary's books are a delight. The perfect blend of humor, romance and unforgettable characters. You can't go wrong with one of hers! Rafe Kincaid has spent years keeping his family's cattle ranch going, all without help from his two younger brothers, who fled the ranch--and Rafe's controlling ways--as soon as they were able. He's haunted by one terrible day at the cave on a far-flung corner of the Kincaid property, a day that changed his life forever. Ready to put the past behind him, he plans to visit the cave one final time. He sure doesn't expect to find a young woman trapped in one of the tunnels--or to be forced to kiss her! Rafe is more intrigued by Julia than any woman he's ever known, but how can he overlook her fascination with the cave he despises? And when his developing relationship with Julia threatens his chance at reconciliation with his brothers, will he be forced to choose between the family bonds that could restore his trust and the love that could heal his heart? 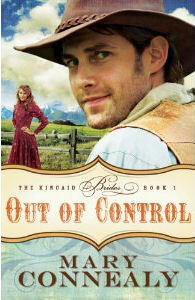 If you would like to read the first chapter of Out Of Control, go HERE. Another book for my wish list. 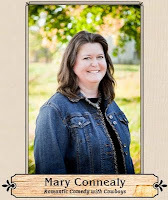 I know I will love reading Mary's latest release.